The Broken Circle: Yarns of the Knitting Witches was written by Cheryl Potter. It is book 1 of The Potluck Yarn Trilogy. Cheryl Potter is known for being one of the foremost experts in the world of knitting, dyes, and patterns. She began writing the novel because she wanted to combine her passion for knitting with a fantasy novel about knitting witches. This first book follows the story of twelve knitting witches through adventures fraught with mayhem and mischief. Twenty years have passed since the fire beneath the great dyepot was lit and the circle was complete. Now, the inhabitants of the Middlelands face a danger worse than any can remember. Darkness and chaos threaten to destroy the delicate balance of the natural world, and the magic of the dye crystals that have always been a way of life, and a great source of power for the people, has been outlawed. 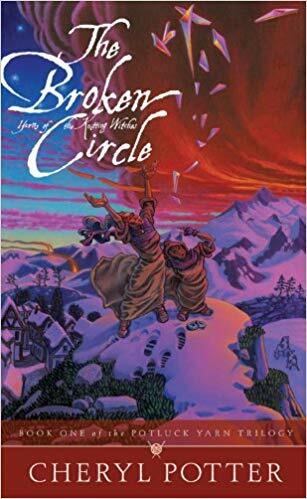 With female protagonists and strong male characters introduced along the way, The Broken Circle introduces themes of family relationships, coming of age, tough decision making, and so much more. Ms Potter's book acknowledgements stated that when she started her novel (multiple times) she was told her book wasn't going to work. It was "cross-genre" or "not desirable". Who was going to want to read a fantasy novel that was also a knitting pattern book? When I started reading... I thought the exact same thing for the first couple of chapters. While I really immediately liked the characters... the knitting references distracted me. I found myself thinking "if I was a knitter that liked stories of witches... I would LOVE this book." At the end of each book chapter a knitting pattern was shared that directly related to the chapter. I was SO thankful that the actual pattern wasn't included, and was just shared through a link to The Potluck Yarn site. As I continued reading the story of the 12 knitting witches I was slowly drawn in. With so many characters, their development is sometimes slow... but they are 12 fully developed characters. It is amazing that I found myself thinking of the knitting of yarns as I read how the characters were all so different... but were all woven together through the story. And, oh gosh, talk about woven together! There are twists and turns and surprises, right up until the last page of the novel. (I just reread the last page... and got a little chill.) When I finished I wanted to keep on reading. I love when a book I start out thinking will be "meh" ends up surprising me. I had a little twitter conversation I had with Cheryl Potter @KnittingWitches as soon as I finished her book. I put the book down and immediately tweeted her. I just want to say.... I love when authors are so responsive to their readers. Most of them are... but Cheryl Potter was so personable. One last thought: When I was e-mailed about doing a book review The Broken Circle for review, Hunter (the PR rep) included a link for The Potluck Yarn's website. "In the spirit of learning, there is an incredibly interactive website with a complimentary reading guide workbook that is available for free download at: www.potluckyarn.com." I HAD to include that statement here. "incredibly interactive" doesn't even begin to cover it. Cheryl Potter has a serious passion for her craft. You can't quite help be drawn right in when her love is so obvious. I'm thankful to have the links to her sites and patterns. By the end of the novel... I wanted to be a knitter. I'm wondering if maybe I could learn to knit just so I could make one of Ratta's never-ending shawls... or Sierra's secret socks!